KJIPUKTUK (Halifax) – Seven unions will file to be added to the partial review of Bill 148 by the Nova Scotia Court of Appeal initiated by the Nova Scotia government. The Public Services Sustainability Act (Bill 148) imposes a four-year wage package on 75,000 public employees, effectively cutting their wages. It also removes a long service award scheme that the unions bargained for years ago. Union leaders of CUPE, NSGEU, NSNU, SEIU, NSTU, CUPW and Unifor explained at a news conference in downtown Halifax this morning that becoming party to the court case will allow them to represent their members and give evidence. Only the wage package is part of this review, the service award component is excluded. The NSGEU has launched its own appeal of the entire Bill 148, but it may be years before this appeal reaches the Court of Appeal stage. Additionally, Bill 75, legislation similar to Bill 148 and affecting teachers, is being challenged by the NS Teachers Union. The news conference also allowed the unions to offer some push back on the provincial government’s narrative on the issues at stake. Many of the 4,500 Unifor members affected by Bill 148 work in in acute and long term care sectors, and are also struggling to make ends meet. “Quite a few of our members make between $15 and $18 per hour, and these workers are getting lost in the narrative,” said Lana Payne of Unifor. Questioning by local media suggested that since the Liberals won the election they now have a clear mandate to impose their will. Lana Payne countered that last year’s much diminished Liberal majority together with the gains for the two other parties did send a message that Bill 148 and other anti-union stances are not as popular as McNeil likes to believe. Unions intend to continue to pick away at eroding Liberal support. I believe Nova Scotians are listening, things like cuts to nursing home are clearly unpopular, said Payne. The impact of Bill 148 resonates beyond the public sector and is affecting private sector bargaining tables as well, union leaders said. 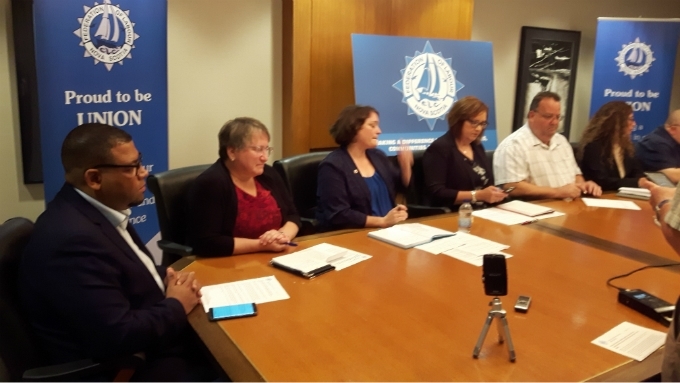 As a result of Bill 148 and other anti union measures Nova Scotia will find it difficult to keep its workers, either through out migration or early retirements, argued both Jason McLean of the NSGEU and Janet Hazelton of the NS Nurses Union. And the impact may be felt in more immediate ways as well, Hazelton suggested. If you can, please support the Nova Scotia Advocate so that it can continue to cover issues such as poverty, racism, exclusion, workers’ rights and the environment in Nova Scotia. A pay wall is not an option for us, since it would exclude many readers who don’t have any disposable income at all. We rely entirely on the kindness of occasional one-time donors and a small group of dedicated monthly sustainers.